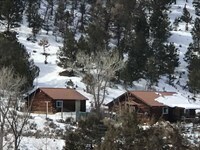 Fantastic Mountain Cabin Escape with tremendous views of the Brazos Cliffs and the Chama Valley. This cabin is in move in ready condition and has massive 12' X 36' Deck with great surrounding views to relax all the stress away and watch the sunrise and sunsets. Large Carport Boat Shed approximately 14' X 32' all covered and enclosed on three sides with pro panel metal. Also has a 12' X 16' Storage Building to keep your toys and outdoor gear.All the comforts of home. All utilities in place with a great deep water well. Property features an Extra Septic Tank and Water Frost Free Water Hydrant perfect for an RV Site with hook ups. Home has Both Central Heat and Air-Conditioning for 365 Day use. 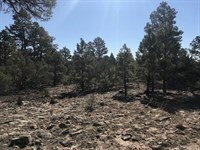 Come and enjoy abundant wildlife with Mule Deer, Elk and Wild Turkey just to name a few.Hilltop views and privacy with great surrounding trees. The Chama Valley has two large recreational lakes and many streams and tons of places to explore all which delight and invite the outdoor enthusiast in us all. Property even includes all it own Mineral Rights.